Summer is slowly giving way to the fall season, and Mono County has a wide range of events this autumn offering all sorts of excuses to come up and enjoy the gold and crimson colors of the Eastern Sierra. Beginning Labor Day weekend and stretching well into October, the Mono County events calendar includes athletic challenges, art and music festivals and culinary experiences. Adventurers should mark their calendars to take in all that the Eastern Sierra has to offer. The Graniteman Challenge, sponsored by the High Sierra Triathlon Club, is a unique three-day combination of the Granite to Granite Swim, a 2.4-mile swim in June Lake on Sept. 7, the Mammoth Gran Fondo, a 102-mile bike ride, Sept. 8, and the Tioga Pass Run, a 12.4-mile run up Tioga Pass on Sunday, Sept. 9. While any athlete can compete in any one of these races, only a select few take on the Graniteman Challenge, garnering the revered title of Graniteman or Granitewoman. Four fun-filled days of off-road adventure come Sept. 11-15 at the Eastern Sierra ATV & UTV Jamboree in Coleville and Walker. Join guided trail rides through the beautiful backcountry for an exhilarating event. Sept. 22 marks complimentary entrance to national parks. This is a great opportunity to visit Yosemite National Park with free entrance. Visit NPS.Gov for more information. Locals, visitors and lovers of the land of all ages are invited to participate in Bodie Hills Stewardship Day on Sept. 29, to clean up an old dump site near Conway Summit. Afterwards, a complimentary barbecue lunch will be held for volunteers including raffle prizes and an archaeology talk at Conway Ranch. Challenge your stamina and grit during the Ridge Rambler Half Marathon in Twin Lakes near Bridgeport on Sept. 29. The race begins at about 7,100 feet and stretches downhill toward Buckeye Road, through rolling hills and finishes at 6,600 feet. The race begins at 8 a.m. and registration fees are $45 per person. The popular Deer Hunter BBQ will host their 54th annual event on Oct. 6 at the Walker Community Center, bringing Secret Lion’s recipe barbecue ribs with all of the fixings, dessert and raffle prizes. Tickets are $15 for adults and $5 for children under 10 years old. The Ducks Unlimited Dinner returns to Bridgeport on Oct. 13, where outdoor enthusiasts of all ages are invited to enjoy a delicious meal and evening of camaraderie as they support fundraising efforts. Tickets are available at Ken’s Sporting Goods in Bridgeport. An interesting event not just for history buffs, the Eastern Sierra History Conference will host their third annual summit from the Sierra Nevada Aquatic Research Laboratory Page Center 10 miles south of Mammoth Lakes, Oct. 26-28. Discussions will cover people, culture and traditions of our region. Annetts’ Mono Village Labor Day Fishing Derby is the perfect event for kids and kids-at-heart to get outside, appreciate nature and maybe even catch a few fish. The derby will be hosted from Sept. 1-9 and word has it the fishing has been great both from shore and boat. Convict Lake in Mammoth Lakes is arguably one of the best fishing in the West as one of the most popular rod and reel destinations. It’s about to be derby time with Ambush at the Lake hosted Sept. 3 – Nov. 15 (entry fee of $15), and Morrison’s Bonus Derby Weekend taking place Oct. 26-28. GrooveSession, Achilles Wheel, Rose’s Pawn Shop, The Higgs, Strawberry Moon, The Brett Davis Experience, Hempstring Orchestra. Ticket sales benefit the Mono Arts Council to fund music in the schools and are available at eventbrite.com. Capture the history and natural beauty of Bridgeport Ranch and participate in some friendly competition during the Eastern Sierra Photography Jamboree on Sept. 15. Photographers of all skill levels can enter as many image categories as they wish at $15 per category to get the shot. Categories include: Ranching & Western Life, Nature & Landscape, Bodie, and Wildlife, Hunting & Fishing. Grab your lederhosen or dirndl and get ready to celebrate Mammoth Oktoberfest, Sept. 21-22, at the Village at Mammoth. This year’s event is bigger than ever with all of the family-friendly games, music and mouthwatering food your heart desires. The Bridgeport Autumn Harvest Festival and Wrecks & Rods Car Show will once again dazzle guests on Sept. 29. The Harvest Festival offers great eats (including a First Responder Chili Cook Off! ), kids’ games, a pumpkin patch and beer garden. Spectators of the Wrecks & Rods Car Show will see finished rides and works in progress cruising the event. And don&apos;t miss the Ridge Rambler Half Marathon before the Festival to really earn that chili and beer. Craft beer lovers rejoice as the 6th annual June Lake Autumn Beer Festival returns to Gull Lake Park on Sept. 29. Seventeen confirmed breweries will have their suds on-tap in the ticketed beer garden, while the music, food vendors and overall family-friendly festival fun will be free and open to the public. The Chalfant Big Trees Farm is hosting a free Oktoberfest celebration on Sunday, Oct. 7, featuring free food, drinks, and raffle prizes. The pumpkin patch opens on Oct. 6 and will be open for a few weeks (as long as the pumpkins last! 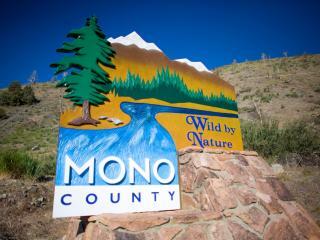 To see more events happening throughout Mono County, please visit our Event Calendar!